A quiet character and a quiet riding style. 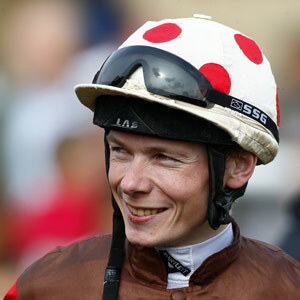 Jamie Spencer has become well known for pouncing from off the pace with well-timed runs, a style that has served him admirably over the years. He was champion jockey in 2005 while operating as a freelance, and repeated the feat in 2007 when sharing the title with Seb Sanders. He has won two British Classics, as well as two in Ireland – making history when winning the 1998 Irish 1000 Guineas on Tarascon at the age of just 17. His father was a National Hunt trainer. He is the godson of Irish racing and breeding supremo John Magnier, owner of Coolmore Stud, and was Irish apprentices’ champion in 1999. Spencer had a brief spell as Aidan O’Brien’s stable jockey at Ballydoyle, during which time he became Irish champion jockey in 2004. The pair split in 2005, with Spencer moving to Britain and flourishing immediately. He had a headline-grabbing year in 2009 when he sealed an Investec Oaks-Irish Oaks double on Sariska. His earlier British Classic came on Brian Boru in the 2003 Ladbrokes St Leger. He teamed up with O’Brien again to take the second Long Distance contest of the QIPCO British Champions Series, the Gold Cup, at Royal Ascot in June 2011, with Fame And Glory and partnered the same horse to victory in the QIPCO British Champions Long Distance Cup at Ascot on the inaugural QIPCO British Champions Day in October. He repeated that QIPCO British Champions Day success in 2012, this time in the QIPCO British Champions Sprint on board Maarek. He signed a two-year retainer with Qatar Racing, a subsidiary of Series sponsor QIPCO Holding, in late 2012 to ride all their horses and started the QIPCO British Champions by finishing second in each of the first two races, the QIPCO 2000 Guineas on Glory Awaits and the QIPCO 1000 Guineas on Just The Judge. He won the Irish 1000 Guineas on Just The Judge and followed that with third place in the Investec Oaks on The Lark and second place on Dunaden in the Investec Coronation Cup. Just The Judge was then third in the Coronation Stakes, a sixth Series place for the Irishman in 2013. He also won the Group 1 Mackinnon Stakes in Australia for Qatar Racing and trainer Andrew Balding. He announced in August 2014 that he was going to retire at the end of the season but, to the delight of many, changed his mind. Spencer was narrowly denied victory in the Prince Of Wales’s Stakes aboard The Grey Gatsby in 2015, suffering a short-head reverse. He hit the frame again only a few days later as he produced a fine ride aboard outsider Astaire in the Diamond Jubilee Stakes to finish third behind international raiders Undrafted and Brazen Beau. Following his narrow second at Royal Ascot aboard The Grey Gatsby, Spencer once again hit the frame aboard the Kevin Ryan-trained colt when chasing home Golden Horn in the 2015 Coral-Eclipse. He duly opened his 2015 QIPCO British Champions Series account with a victory in the Qatar Goodwood Cup aboard Big Orange. Spencer produced a trademark strong ride and managed to ward off the fast-finishing Trip To Paris and the dogged Quest For More. Spencer renewed his association with The Grey Gatsby in the Juddmonte International Stakes where the pair finished a respectable third behind shock winner Arabian Queen and old adversary Golden Horn.